Can Tippers from Essex Drum Handling - 5 Gallon Can Tipper, Morse Pail Pro Can Tipper holds and pours the contents from your 5 Gallon Pails ergonomically into a smaller can. 5 Gallon Can tippers come in stainless steel for ultra-clean environments. Eliminate the need to repeatedly lift heavy 5 gallon cans to pour them. With a 5 gallon manual can tipper you can simply set your can or 5 gallon can into the 5 gallon bucket holder and adjust the catch assembly to the height of your can. Then you can easily pour from the 5 gallon can tipper to easily pour into another receptacle - just use the top handle to tilt, pivot and pour from our Morse 5 gallon can tippers. Morse can tippers can pour one 5 gallon pail while the safety lock holds the 5 gallon can in place. The can tipper dispenses at 10" and then folds up for storage. 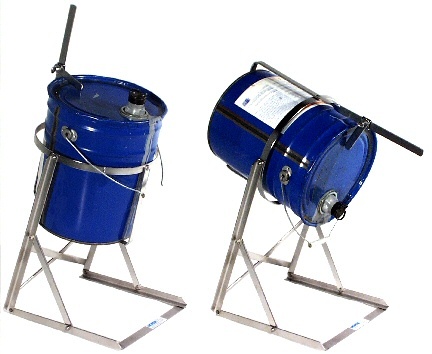 Morse PailPRO TM 5 Gallon Can Tippers dispense from your 5 gallon pails. 5 gallon bucket holders make it easy to pour contents from 5 gallon buckets or cans ergonomically. They simplify and speed dispensing, while reducing the risks associated with repetitive lifting. Customers refer to Morse 5 Gallon Can Tippers by many different names, including a 5 gallon bucket cradle, can cradle, bucket tipper, bucket holder, bucket pour stand, 5-gallon cradle stand, tipping stand, can dispenser, tilting stand, pail tilter, pail tipper, or can dumper. Whatever you may call it, it's a convenient way to dispense your pail. Just pivot to tilt and pour this 5 gallon can tipper with no more repeated lifting and pouring.